1. You have to manually open the whatsapp to get notifications. The screen goes off when the brightness is set too low, and the navigation bar is laughably large. 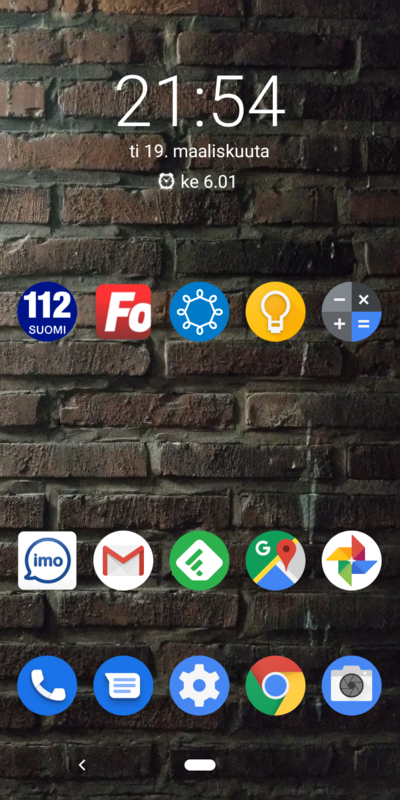 I use Apex classic launcher. Works fine. after pie update, my Screen Lock constantly failing to recognize my correct pattern, it says "wrong pattern" even though I did input the correct pattern, it can be solved by restarting temporarily, but this issue will come back soon after restarting. it is so so disappointed when you try to unlock your phone with correct pattern but it tells you "wrong pattern"
it that just me or is happening somewhere else as well? About the whatsapp issues: it also affects signal, and I remember similar issues from release on 8.0, so I HAD to go into applications (see all apps->...->show system) and disable the com.everwell.powersaving apps for it to work properly. If someone has an un-updated 3.1, let us know what app versions are on your device. Mine isn't updated yet, my versions of the apps you mention above are identical, all I've done to make WhatsApp work flawlessly is to deny its power saving mode in battery settings. My handset is a generic TA-1057. isn´t working . Clients can connect but no internet. > Mine isn't updated yet, my versions of the apps you mention above are identical, all I've done to make WhatsApp work flawlessly is to deny its power saving mode in battery settings. > My handset is a generic TA-1057. Yeah, don't know, for me it was fixed in 8.1, this is a regression. Bluetooth volume when connected to a speaker is synched, meaning changes in volume on the speaker or the phone affect the same volume control. This results in one setting being too quiet and the next one being too loud. I am actually livid, this ruins the device for me. The workaround that worked before Pie doesn't anymore, disabling absolute volume in the developer settings. It's a sad joke. here we are only writing but no one can read that we have broken the phones with this update he is interested in. Now you can try to see them behind the "+" button, but setting them will crash the settings apps. when volume set to 0% and I'm trying to play some media on phone the speaker starts "shhshhshh". Got it after updating to Pie. Sim card preferences for mobile data calls and sms are reset quite often. @Quentin Bertram just go into developer options and turn on "Disable absolutely volume"
The copy paste feature on multitasking doesn't work. The action sevices app is always crashing. I cannot set screen lock or become developer. Phone asks for device pin code but does not accept correct one. When hotspot is on, two icons appear on status bar. There should be only one. I get no push notifications on any app is there any workaround? I've been a long time Windows Phone user only to move to Android last september. After an initial period of getting used to the system, my N3.1 was running just fine until the Android 9 upgrade came along. I have had many long and frustrating chat sessions with Outlook support as well as Nokia support. Both had me do all sorts of Cache wiping and App pref. resetting. Nothing helped. At one point I decided to give my phone a factory reset and set it up all over again. I have a strong feeling that something is fishy with this Android 9 upgrade and I am desperately looking forward to fixes coming sooner rather than later.